This entry was posted on Tuesday, April 16th, 2019 at 6:20 am and is filed under Uncategorized. You can follow any responses to this entry through the RSS 2.0 feed. You can leave a response, or trackback from your own site. Another of those days when one needs to keep coming back to the three points and the result!! Otherwise you have to keep listening to more and more exaggeration as to the facts!! “Not only were Watford the better team, they deserved the three points”. ” Ten minutes in, could have been a yellow, but never a red”. ” He brushed his arm across Torreira’s face”. Poor poor performance. No end product from Micky and Wobbly. Mustafi eighth best CB at Club. Mav nervous. Aubang could/should have had a hat trick. Micky should/could have had two. Ramsey and Terrier removed took away drive from middle. Much wrong, BUT THREE POINTS. Will need different mindset against Napoli. Made my comments at end of last post. Frustrating to win and yet still feel a little dissatisfied with much compared to joy of Napoli game. Timing…..like Aubang and Micky all wrong this morning Chas. Thanks again for all your efforts for best blog site in Christendom. Definitely a case of rejoicing in the result rather than dwelling on our ineptitude! Hey, we accept all faiths here! I definitely wouldn’t have given Mkhi a 6.. that was probably the worst he’s played for us! A point to prove ….. It was such a relief to hold on and get the 3 points. Perhaps these guys need a psychiatrist to find out how they play great attacking football one game, (Napoli) and then absolute rubbish? No one can fault the three points, but Emery needs more than the reputed £45m transfer fund this summer to improve this team. Cheers Chas, not easy to make something of that game but you did it. Emery an 8 must be a joke; he almost singlehandedly lost us that game with his lack of tactical adjustment (especially after the goal and sending off) and bizarre substitutions in the second half. The team fought hard but looked clueless and leaderless which was a worry. Agreed with the player ratings but I think if you watch the second half again you would give Iwobi (sad to see you still call him that derogatory name: a defence is wobbly, Alex is not) a higher mark as his attacking play and final balls to attackers were quality. Xhaka looked rusty and a bit heavy but it could have been that awful green ‘outfit’; it seems the injury really has had an affect on him. Koz, Mustafi and Monreal – all ‘first soldiers’ – all fought hard but non of them have the calm and organisational skills of (a) Sok, and so we missed him a lot. Leno was superb and probably showed the biggest cojones other than Torreira (who at least deserved a seven for taking the game to the excellent Watford midfielders). 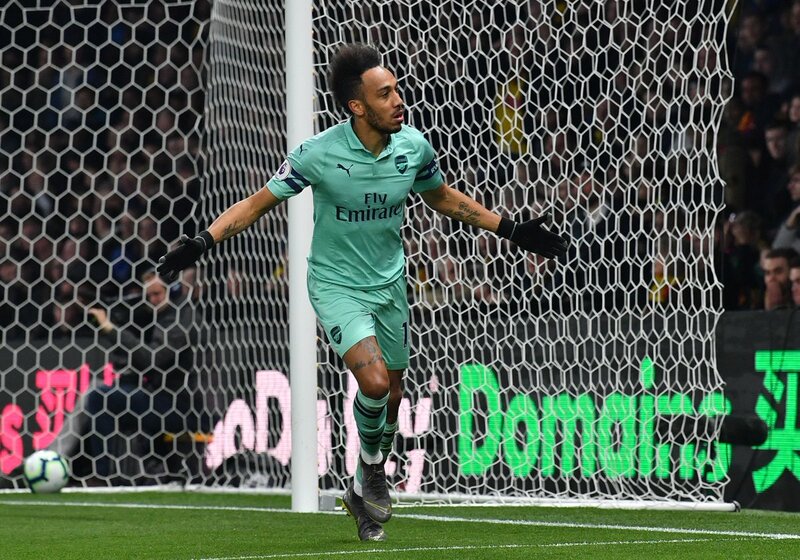 Auba worked hard and got the much needed first (and only) goal. Yet he also lacked the calm and focus to score the so necessary second one in the second half. Mkhi reminds me more and more of Arshavin: some days he is ‘at it’ and some other days, like yesterday, he seems in a melancholic, what am I doing here, bubble. Best part of the game (other than the goal and sending off of the bully) were the first 15 minutes or so of the second half. Then Emery changed the structure again and replaced a defender with a (attacking) midfielder and it was an embarrassing chaos after that. We need the Sok back at Napoli and hope for Xhaka to have lost his rustiness now. I may be more critical than some others of Emery, but that second half (and lack of tactical adjustment after the gift horses of the goal and sending off) really got me worried again. Three more PL away games to come… no need to watch an horror movies till the summer! 2 really nice goals from Eddie 👏 and well done to Jenko for scoring… love beating Chelsea!! So CL tonight… what if United came back to win??? Omg just imagine it!! I was amazed at how poor Barca were at Old Trafford… I hope they win, just as much as I hope City win tomorrow. The way things are going, it’s looking like Liverpool could win it 😫 That breaks my heart saying that… and what if they win the PL too?? I’ve got my ear plugs ordered.. as we’ll never hear the end of it if they do! Bit harsh on Emery no? The biggest change since the Christmas bust up between Emery and Ozil is that Mesut has been made to realise that when we are on the back foot he is almost always a passenger and it is better that he is on the bench (and as an aside) I think that he will almost certainly start on the bench on Thursday when Napoli will throw the kitchen sink at us. But — when we are on the front foot Ozil is our man and just before the end for the first half almost all the play was in their half so I thought it made complete sense of Emery to bring Ozil on when he did. Did anyone expect Watford to take the game to us the way they did with only 10 men; they played well so respect to them. As it turned out Ozil was as ineffective as was Mkhitaryan in fact I thought the whole front line were poor. As for Xhaka, I agree that he was a bit out of sorts but like you I put that down to the awful colour of the kit. Maitland Niles (cons) steadied the ship and possibly saved the day with his game saving tackle near to the end. I don’t think AMN steadied the ship but his individual contributions were important. Why not bring him on for Mavro as the second substitution? That way we could have kept the shape we had from the start of the second half, keep dominating them in their half and take one of our chances to finish the game off. Really did not get the Guendouzi for Mavro substitution. Re Ozil, he is always first on the team sheet for me. Give him freedom to express himself and his hard work to find space and players in space with the ball will pay off. He is a chess horse not a work horse but I don’t think Emery gets that. I take your point re Watford playing well, but Emery did not seem to know how to make the extra player count. Playing two mainly defensive midfielders, rusty Xhaka and energetic Torreira, did not work when playing a team of 10. They sat too deep and kept our attackers too isolated. I did like that Emery brought on Ozil for Torreira and moved Ramsey next to Xhaka but that should have been after 25 minutes rather than 45 minutes imo. Morning all, that was an accurate summation of the game Chas but I feel the ratings were a tad generous. Mkhitaryan is taking the Micky out of Arsenal and we need to find him alternative employment in the summer. Every club knows that our team can be bullied – so they play the odds and don’t allow us to get into a rhythm – and we then do the expected and falter. Napoli will do more of the same and their players will be feigning injuries and diving all over the pitch – it will not be very pretty for Arsenal fans. This is interesting, you will find it hard to find a greater fan of Ozil than myself but I ask: what does the last sentence mean in practice, and that is what I have tried to articulate. In fact I would go further and suggest that Ozil’s name being the first on the team sheet is dated and what’s more he knows it himself. 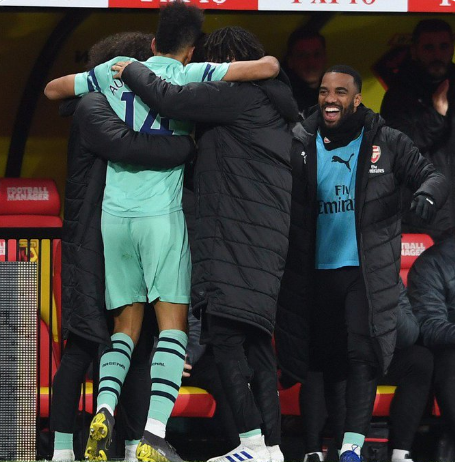 He no longer sulks but appreciates the change in style that Emery has brought and now understands that he still has an important role to play in it although he now realises that there will be certain games when others are better suited. Look at the Everton game, Ramsey was injured as was Xhaka and Torriera was banned so Ozil had to play a more diciplined role which he completely failed to do yes you can argue that he is a chess horse but that just backs up what I am saying that there are certain games when chess horses are a vanity that should not be entertained. Moving from Everton to Naples, Ramsey is back Torreira is the shield, we purposely played on the front foot and Ozil was magnificent playing he floating role. Rather than chess horses and work horses, I would say horses for courses. Bloody hell, I posted my comment on the previous post. I guess been stuck in the past is the terrible price all 50 year old Batchelors must pay. Nice to see you, Terrence. Hope you’re keeping well. That was a strange game.It reminded me of the time i had a fight with the Vicars son and lost. i’m convinced the sending off worked in Watfords favour. There players were so delighted to see the back of the narcissistic Deeney it gave them a hugh lift. Come to think of it, we should buy Deeney and keep him on the bench, that way we would probably win 3-0 every week. The way to counter Watfords tactics would have been to confuse them by getting one of our own .red carded. Most likely would have won by two or three. if Mickytarian got it, we would have seven nil. After the battering form the Vicars son, for a while i turned away from the Lord. Thankfully Liam Bradys 25 yarder against Totnumb soon turned me back to the church and now I am a religious fanatic, but any more away performances like that and we wont just be all turning away from the Lord, we shall all be seeing him. Ah Ha Terry’s back – we can all smile again – welcome back Terry. What a pleasure to read one of your comments again they never fail to put a smile on my face. Cheers lads. Accepting my Batchelor status should mean i have more time to post, Work permitting of course. Making money is the consolation. That old saying is very true, “Money is so much more enjoyable when you have no one to share it with”. I was talking to the other bandits on another blog site recently who had also given up on you — any 50 y.o. bachelor who gets beaten up by the vicar’s 5 y.o. son needs to buy us all a pint!! That aside, Terry baby, I have missed you since returning to AA myself. I love your adage, above, about money, and it reminded me that you said you were bullied at school by a fat lad, and even now that you are a qualified accountant he still takes your lunch money, but on the plus side, he makes you great Subway sandwiches. The life and times of Telescope Terry, will go down in history. Le Coq-a-doodle-do told me he loved borrowing money from you because you are such a pessimist you never expect it back. Sue I was born in Avenell Road and spent my misguided youth around N5 and N7. I saw my first game in 1947 and I’ve never looked back. Moving away from my beloved Arsenal was a huge wrench and I went back and forth for many years. Once my parents passed away I’ve only been back on a few occasions and recently some iffy health issues have made traveling long distances a problem. My son designs and installs home theaters so I’m surrounded by all the electronics I need to see every game. My son’s surround sound home theater includes a 120″ screen – so we watch all of the big games at his place. Well, will take the 3, but that performance was worrying on so many levels. About pool, they will draw one game, and $h+tTy will take the title, but both will be knocked out of CL along with the spuds. The Arsenal will eek out a top 4 and win a Europa league trophy. That is my glass very full. Sue, Most of the changes have been for the better – we used to stand at the clock end in all sorts of weather watching grown men kick a leather ball about in the mud. Back in the day we only got news on the radio or the back section of the newspapers. I could write a book on the changes in the game (pros and cons) in fact I may write some posts during the summer months. Nothing wrong with a romantic view of football Total, my heart sings when I find out that Ozil is in the starting lineup. Ozil is a player that has magic in his feet and an uncanny ability to find the perfect pass. Expecting him to become an “all rounder” and assume defensive responsibilities is a bridge to far. We need him to be available to construct a move with a touch of magic – not laying on his back after a defensive tackle. So I obviously agree with you he is a special talent who lights the game up – unfortunately we will lose Aaron who is also a beacon of light. Like LBG and others I am grateful for the 3 points but a tad concerned about the performance. I still think we change our attitude in how we should play from home to away games. I guess many will feel that a team should have a different game plan with away games but I would argue that should mainly only be relevant against the best teams and with the other teams we should be more aggressive in our attacking play. At home I feel we commit men forward more to the attack and play on the front foot but away we seem to go more cagey and try and slow it down too much, playing too deep, and seem to invite teams onto us. It feels like we are over thinking it when we go away rather than just play to our strengths. I don’t actually feel we have the right balance and players in the squad at the moment to effectively facilitate a different style of play away from home, so would be better suited to just playing every game the same as we do at home. On Thursday our attitude should be to score 1-2 goals, not to overly focus on protecting what we have. Piano man is back for the Mancs then, albeit on the bench…. 🗳 It's time to vote for your Player of the Season! Ooh De Gea howler!! As much as I moan about our green kit – that kit United have on really is gross!! Agree totally. It is almost a return to the bad old AW days away from home. Side, side, back, side, back! Dynamic is the word I like to use. Swift passes “through” the lines. Ozil rather than Xhaka style. The missing links for me are quick, solid, intelligent CBs ( perhaps Holding and Mav) and genuine wide, quick, “wingers” with end product. (Not sure we have them in academy). Sure, Ajax look good here, but how would they do against 10 man Watford on a Monday night? There’s far too big a chunk of the season to go to vote now. Thank you Barcelona 👏👏 hope tomorrow night is as good! Barcelona vs Ajax CL Final would be hugely enjoyable.